Emerald Island Resort, Kissimmee. This prestigious, 5 star, 24 hour manned, gated community, set in 11 acres on a conservation area. Resort community amenities: gated entryway, community pools and spa, sauna, game room, snack bar, cyber cafe with internet access, sand court volleyball, tennis court, exercise facility, children's playground and nature trails for biking and picnics. Is the closest to Disney World yet just 30 mins from Orlando International Airport. 3 mins from the nearby Formosa Gardens Centre with a huge supermarket, ATM cash dispensers, pharmacy, shops, banks, tourist information & a large choice of diners. For the golfers, there are many wonderful golf courses close by including Disney Resort Golf, Orange Lake Country Club & Highlands Reserve Municipal Golf Course which are all just a few miles away. This single storey Florida home features 4 bedrooms, 3 bathrooms, heated pool and spa with child safety screen. Brand new air-con system installed august 2010Bedrooms: Master bed 1 queen bed,TV patio doors 2 pool phone,safe Master bed 2,double bed TV/DVD player,clock. 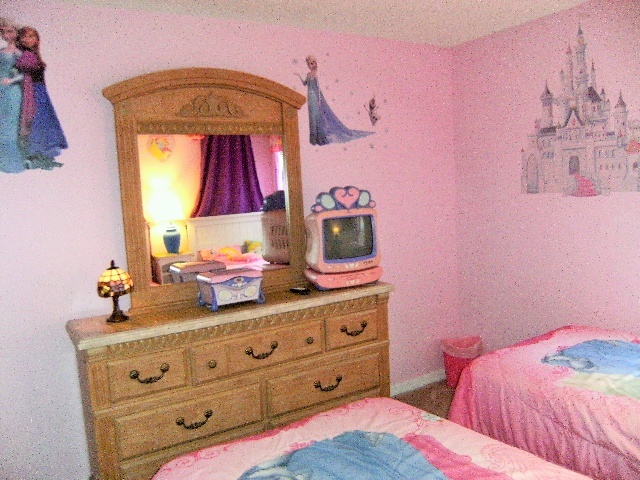 Bed 3 & 4 with twin beds.All large wardrobes & drawers, Disney themed bedrooms have Mickey Mouse/princess TVs,DVD players,New 4in mattress cover in 2 nd main Bathroom: All bathrooms have bath/shower, toilet and vanity units including en-suite to master bedrooms also access to pool in queen bedroom. Hair dryers in all bathrooms. Kitchen: Luxury fully equipped kitchen with cooker, dishwasher, microwave, oven, fridge/freezer with ice maker, blender, kettle, coffee maker, electric can opener, toaster, all pots pans utensils etc tea towels, dish cloths etc. Living Rooms: Open plan lounge, dining and breakfast area. 3 sofas (1 queen sofa bed ), coffee table, 2 side tables with lamps,Smart TV cabinet, DVD, Playstation 2, stereo, breakfast table with 4 chairs, dining table with 6 chairs and one with free USAl calls. Other: Garage with washer and dryer. Games room in the garage with 8 foot pool table. basketball game,air hockey gamestable.football table, boardgames. 5 bikes (2 adult/3 kids) linen-: All towels and linen are included in the price and is cleaned prior to your arrival. Everything was wonderful we had a great time.The only thing I suggest would be new frying pans.